The 2018 classes of SAMS and CGSOC are nearing completion of their academic year. – We wish them well as they head back into the operating forces to put their knowledge and skills back to the test. In this edition we continue our “CGSC 101” series that highlights the College’s teaching departments and schools with a feature on the Command and General Staff School (CGSS) and the satellite schools that also teach the CGSOC curriculum. We also have reports on the 9th annual Fort Leavenworth Ethics Symposium, the latest NSRT program lead by SAMS, our Leaders of Tomorrow Symposium, the newest inductees to the IHOF…and much more. 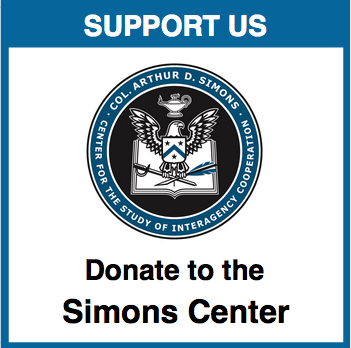 We also have dedicated some space again to thank our donors, without whom our mission would be impossible. Last, in the CEO’s column you’ll see a link for a survey. 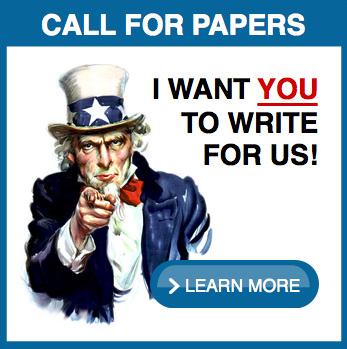 – We’d love to get your feedback. Please enjoy this 24th edition of the Foundation News. 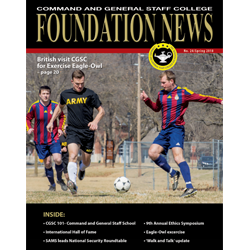 Click the cover to read this edition on the CGSC Foundation website.